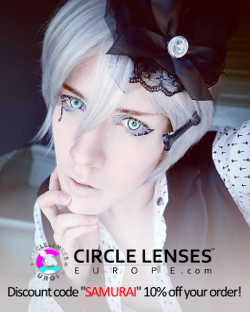 I'll continue with the circle lenses as mentioned earlier – I have a lot of pairs waiting for their turn this summer so I'm totally gonna be chugging out a ton of reviews! Today's review will be about the Starry Eye Gray lenses made by TheDollyEye (aka DollyEye). I normally don't really care for gray lenses that much, as I think it's a pretty boring color, but I must admit that these lenses are something else! The Starry Eye series are really amazing in terms of design; it's one of those lenses that are really versatile and stunning. The print might not look all that extraordinary on first glance but it does transform your eyes into these glimmering, popping gemstones! One lens in. Notice enlargement. As you can see I have naturally light blue-gray eyes and these blend like a dream for me! The transition is so soft and fluid that you barely notice where the lens meets my real eye color, it's amazing. I also adore the pretty 'halo effect' at the edges, really gives my peepers that alluring, mystical look. The enlargement is pretty nice and the opacity does its job in perfect harmony. The lenses make such a fresh sparkly and lively look to my eyes – it's a really captivating and magical effect! I seriously love how these look, definitely one of my top favorite gray lenses that I've had so far. Never thought I'd be so captivated by a gray lens, lmao. All photos taken by me during a May afternoon with a clear sky. Close-up photos are all free from color filters etc and that's so that the colors would be as true to real life as possible. Natural room light in my apartment. Yellow room light in my apartment. Outdoors, facing the sun while standing under a shadow. Outdoors, back against the sun. Comfort is pretty nice. Bear in mind that I have problematic eyes that are really dry and sensitive, but even I can wear these for about 3-5 hours, which is really good in my standards as my eyes usually reject lenses after the first couple hours because of dryness. These are super easy to insert and really thin and comfortable – I barely feel them in my eyes, except for when they blur my vision for a few seconds every now and again. I could keep praising these for all eternity but I just seriously dig how they look! It's such a soft look and I can't get enough of how they make my eyes look like bright crystals with that kind of fantasy flair that brings your thoughts to the purest beings. 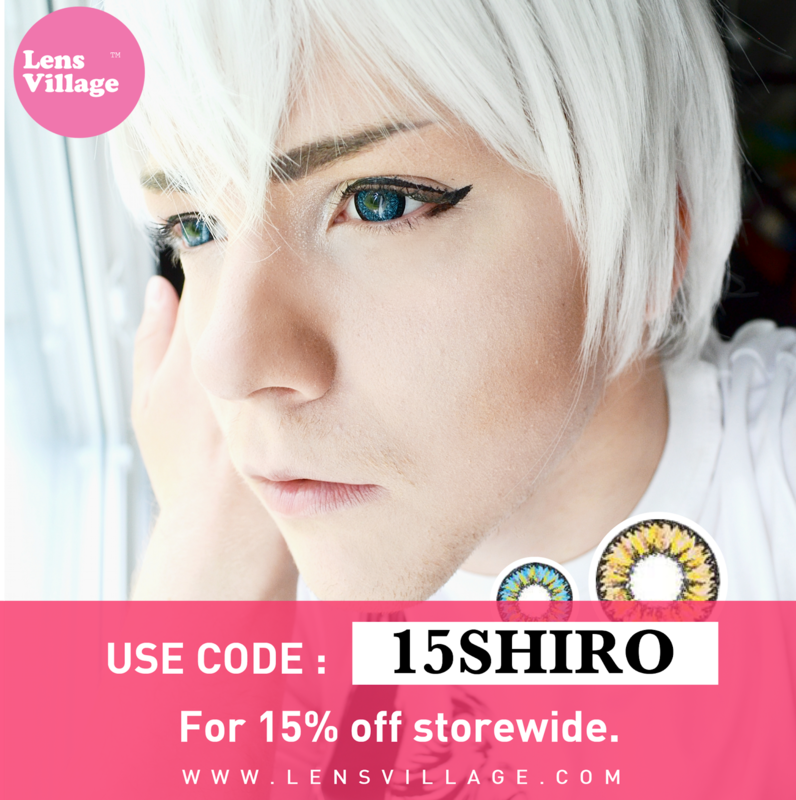 It's a super cute and attractive lens and I would recommend it for cosplay and j-fashion alike! The Starry Eye lenses actually almost look better in real life because of the nuances and reflections it does in all the different lights (I feel like my photos don't do them justice at all), it's simply fascinating how colored contacts can do such a big difference. Seriously get these if you want eyes like an angel. Want to see more Starry Eyes? Absolutely gorgeous gray that looks so fresh and ethereal. Even better in real life! Beautiful design with a 'halo effect' and great depth to the way the color shows up. 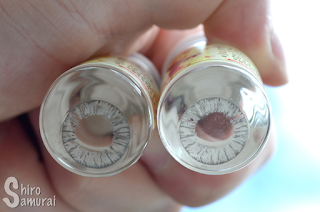 Surprisingly good coverage when judged by how "streaky" the lenses appear in their vials. Big eyes are big but not overwhelming. Great. Really thin, easy to insert and invisible to wear. Blurs my vision sometimes but otherwise really nice. Estimated wearing time around 3-5 hours on dry eyes. Thanks to the absence of a prominent black rim and the flawless blending these do pass off as semi-natural. Thanks for reading my lens reviews, I appreciate it! I'm selling retro games (PS2, Wii, NDS) on Tradera right now! Have a look! 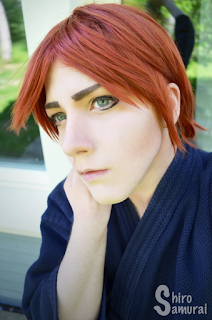 Throwback Thursday: Jushiro Ukitake cosplay from Bleach! Read about my old captain Ukitake cosplay! Includes personal story! All the reviews in this blog are made with my honest opinion and based on my own experiences – even sponsored reviews. Also, all the photos in this blog are taken by me, unless mentioned otherwise. Please DO NOT steal or use my photos –or any text written by me– without permission and proper credit. Thank you for your understanding. My cosplay story – Self-esteem issues, dealing with hate & victories! The making of Hotaru's tengu geta! EXPLORING TURKU CASTLE AS GUILDIE! Ai vuoden conikuulumiset yhdessä päivityksessä? Oi kyllä! Pohjoismaiden coniseikkailut - Ulkomaan coneista kiinnostuneille. Utashiro: Hakamat ja miljoonat härpäkkeet. So Happy New year a day late. Aivoriihi: Lavajuoksut - In vai Out? First Wig Review And New Cosplay Plans! NerdCon 2015 cosplay plans! ...land crabs. "Contact lenses – The advice and "what not to do" list!" 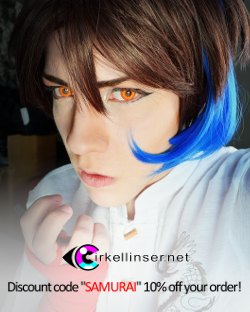 "Cosplay with circle lenses – Necessary or not?" "Guideline approach: Cosplay decision process"
"Help! I want to cosplay a kimono character!" "Me VS. makeup – How cosplay made me face my long-time enemy"
"My cosplay story – Self-esteem issues, dealing with hate & victories!" "My cosplay strengths & weaknesses – REVELATION TIME!" 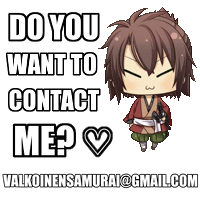 "Shiro Samurai edition: Who ends up in my cosplay list and why?"